Happiness is....acquiring my own house! Nga pala, okei na ba yung problem mo sa pag-attach ng badge? Nag-a-appear naman dito sa'kin. Having your very own home is really an achievement. And take note, you have not one, but two! Now following your blog; hope you don't mind following mine, too! Nothing can beat the feeling I tell ya. Congrats! Friendship is happiness, hope you can visit. @ KM, thanks KM! hidi pa din okay yung sa badge page ko sa LTT eh. Di ko nga lam panu yun i work out. congrats on the new house Sis :-) so happy for you. Returning the visit from Happiness is, do appreciated your visit in my entry too. Thank u sis! It's always my pleasure to visit you. wow! that is so cool! i wish to own my place one day without hubby. lol. thanks for visiting my Happy Me! Ate Krizza nag follow ako sa blog mo. Yung lumalabas na author sa entry mo noreply@blogger.com(KRIZZA) sa dashboard ko. Every person dreams of having their own house. And i'm glad you fulfilled that dream early on. One day,I wish I'll have the same happiness too. 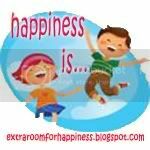 late visit here for Happiness Is... for my other blog, Redlane Geraine. @ MaiThreeBoys, Thank u Sis! Yup, I hope you'll be able to get your own house someday, too and by that time, I am sure that you'll be very happy. so sorry for the late visit...thanks much for visiting!